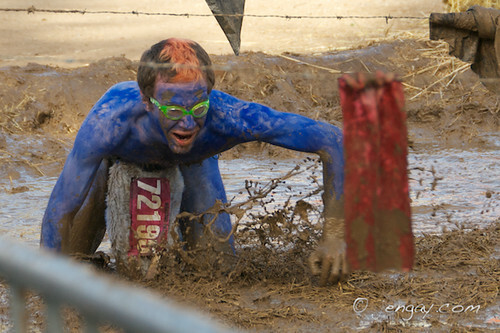 Sometime back in May we signed up for the Warrior Dash, something I wasn't one hundred percent sure I could do, but I damned well wanted to try. 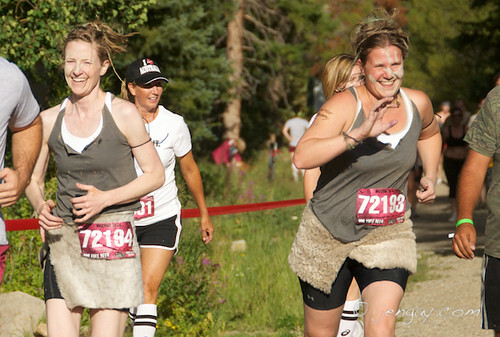 It's a 5K run up and down the side of a ski-slope (Copper Mountain) with a bunch of obstacles thrown in for good measure. And look we're smiling! In fact, I smiled for most of it. It just felt so good to know that my body was up to the task. We'd started out at the very back of the pack, the 3 last people in fact, possibly because we knew our best pace and kept to it. By the time we made it to the really steep part of the hill, most of the people around us were walking. Going up the hill, several people even cheered for us as we passed them. A fact which really typifies the race... not a lot of pressure, but plenty of fun. Jenny and Aurora and I did it, along with Aurora's husband and Jenny's and my little brother Matthew (who painted himself blue in honor of our Gaelic heritage). So, yes, for those of you who are asking, I did make it over the wall. Luckily it was nowhere near as tall as the one we'd practiced on. There were actually three of them, though, so that sort of made up for it, difficulty-wise. 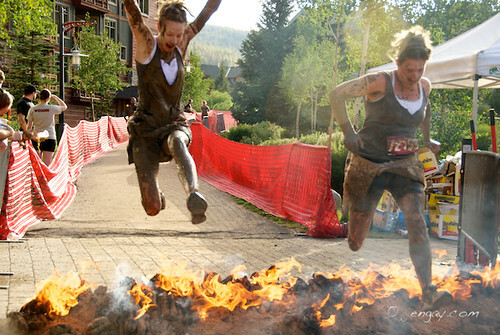 No pictures of us on the wall, but here we are going through mud and jumping over the fire. And finally, here's a video that I didn't take, but was made on the same course that we ran later in the day, so you can see the obstacles from our point of view. And though it might not look that bad, I have to say the most difficult obstacle was going uphill through the tubes. Gotta get me a helmet cam for next year's race. Note- the rest of the pictures from that day can be found here if you're interested. 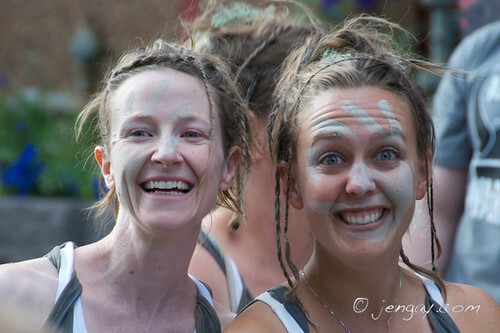 You ladies totally rocked that race and WOW it looks like such a fun event. 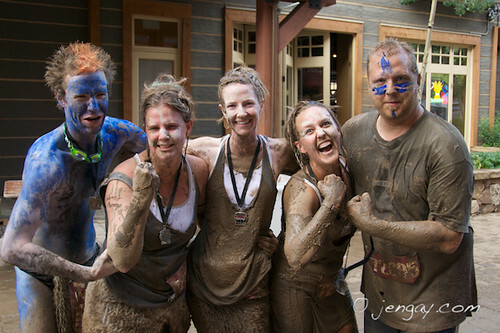 You look great covered in mud AND VICTORY! 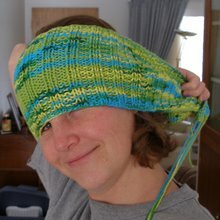 You guys never cease to amaze me, Wendy! Very awesome, and congratulations! 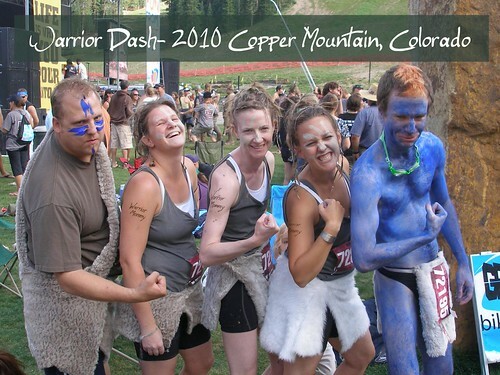 Wow, I had no idea that I wanted to run a warrior dash until I read this post. Look at you! You rock. I love this and your blue brother, what a riot. This is full of too much awesomeness!! What a kickass event, and you all kicked some! Wow. That looked like an amazing time. I've been looking for an obstacle course near Toronto, Ontario, where I live. It gives me great pleasure to know you've experienced it's joy. 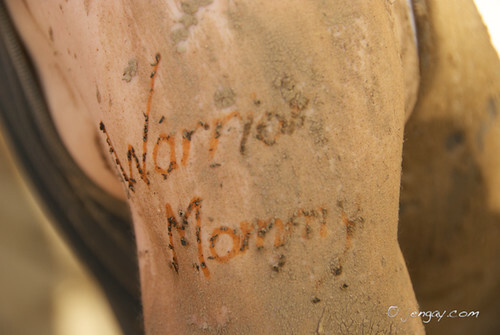 So cool - Warrior Dash - love it.